May is prime planting season around here, for flowers and vegetable gardens. If you’ll be buying plants check out my ideas for saving on outdoor plants. Moms work hard. You should thank them! Just make sure you include any flowers, cards, or gifts in your budget. You don’t have to spend anything at all, though. You can tell your mom how much you appreciate all the sacrifices she made for you. Trust me. She’ll appreciate it! Do you have a graduate in your life? If you’re throwing a party or attending one, make sure to budget for the expenses. Memorial Day Weekend is the kickoff to the summer season of traveling, BBQs, and family fun. It’s easy to overspend when the weather warms up and we forget all of our troubles! Mulch is an expense that always seemed to sneak up on me! A few years ago, I finally increased our “lawn & garden” sinking fund enough to cover it. If you have a lot of flower beds around your house, it can be a pretty significant expense. Pools will be opening around here in the last week of May. Do you kids still have swimsuits that fit? It seems like half of my town is getting ready to move this spring or summer. If you’re planning to move to a new home soon, make sure you’ve budgeted plenty for moving expenses and check out my post about easy ways to save on your move. What did I miss? 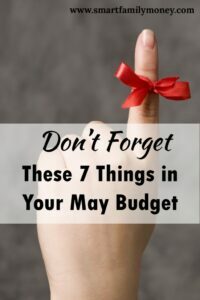 What are you including in your May budget? Comment below!